France Córdova (PhD '79), director of the National Science Foundation (NSF), recently visited Caltech to meet with students and researchers, and to give a talk about the role of the NSF in advancing basic science research—and in translating that knowledge into future technologies. The winners of three Caltech scholarships supported by Córdova were announced at her talk: Caltech graduate students Sarah Gossan, the 2016 Garmire Scholar; David Aasen, the 2016 Tombrello Scholar; and Michael Eastwood, the 2016 Neugebauer Scholar. Córdova has led a distinguished career in science, holding leadership positions in academia and the federal government. After earning a PhD in physics from Caltech, she conducted astrophysics research on X-ray and gamma ray sources in the cosmos, first at Los Alamos National Laboratory and then at Penn State. From 1993 to 1996, she served as NASA chief scientist, becoming the youngest person and first woman to hold that title. From 1996 to 2002, she was the vice chancellor of research and a professor of physics at UC Santa Barbara, and from 2002 to 2007, she was chancellor and distinguished professor of physics and astronomy at UC Riverside. In 2007, Córdova became the 11th president of Purdue University. In 2014, she assumed her role as NSF director. We sat down with Córdova to talk about her visit to California and the goals of the NSF. What was the reason for your trip to Caltech? About once a year, I take a trip to California to visit universities like Caltech and industries and foundations. My trip started off with the Breakthrough Prize ceremony in the Bay Area, where Caltech and other LIGO folks were honored. I gave a talk at UC Berkeley and visited Google and other companies and foundations. I also wanted to visit the pilot projects for our Includes initiative because it's so new, and I wanted to see how people were thinking about those projects. Caltech naturally fit in to my visit—it's one of our top-five funded universities in California. I have an emotional connection to Caltech having been a graduate student here, and I know a lot of folks here. Why are trips to universities important to you? I always like to hear what students are thinking. We've had several meetings with students at Caltech on this trip. If we are going to have an innovative, responsive portfolio at the NSF, we need to have some ground truth. We need to know what students and faculty are thinking and where we have constraints. To give you an illustration, unlike NIH [the National Institutes of Health], we don't have a postdoc program that is similar to our graduate research fellowship program. Talking to postdocs here helped reinforce the idea that we should be looking at this more closely. I also heard a lot from students about inclusion and diversity, and we can work with universities to help reinforce that these values are very important. Having been a university president, I like to be around young people. I truly believe that they are the engines of tomorrow. Students are going have the ideas that really shake up the world and transform it. What do you think are the next big ideas in science? We recently came up with a list of 10 big ideas. These are areas with potential for huge breakthroughs in the future. Six of them are research ideas, and four of them are process ideas for funding research in better ways. The research ideas include leading the next quantum revolution, harnessing the data revolution, shaping the future of work, navigating the new Arctic—what are all those changes happening in the Arctic, in the atmosphere, and to the land and oceans? We have a big idea for astronomy—we call it multi-messenger astrophysics. How do you utilize the new observatories in particle, electromagnetic, and gravitational-wave regimes? In biology, the question is: How do you get from genomes to you and me? It's still a mystery. This affects so many areas, even plants, which we all depend on. We can better understand photosynthesis, which is an inefficient process. This can help us figure out how to increase the world's food supply. Knowing the rules of life also informs our search for life elsewhere. We still don't really know how to search for alien life. Life elsewhere is not going to look like you and me—it's going to look creepier than it does in Star Wars! The four process ideas are about the business of evaluating and funding research in better ways so that we don't leave ideas on the cutting-room floor. One example is NSF Includes, a program that broadens participation in science and engineering to people who are underrepresented in the United States. We just funded 40 pilot programs. How does the NSF support basic R&D in science? We like to say that the NSF is where discoveries and discoverers begin. We fund the best research and researchers. We pride ourselves on often funding the first grant in a field. A researcher starting out with something high risk is curiosity driven, and we fund their first prototypes, whether they are theoretical or the nuts and bolts of a device. We fund a lot of graduate student fellowships and international programs, and the big facilities in astronomy, the oceans, ecology—it's a broad portfolio. We cover many domains in science. When you do really basic research, it's hard to see where it's going, but this type of work has led to many important applications like the Internet, cell phones, and even the voice of Siri, which started with artificial intelligence research. LIGO was a significant moment for the NSF, Caltech, many other partners, and science as a whole. Why is it important to take risks in science? Big risks can lead to big rewards. With LIGO, we did have an objective—to detect gravitational waves—but it was a real challenge. Even Einstein thought it would never be done. We hung in for 40 years, and it paid off! There a lot of false starts in the development of many technologies, but they aren't failures. You learn and try something else. The Caltech Garmire, Tombrello, and Neugebauer supplemental scholarships are named after Caltech faculty Gordon Garmire, Tom Tombrello and Gerry Neugebauer, respectively. Córdova established the funds to honor professors at Caltech who have had an impact on her life and on science, and to provide assistance to graduate students who show great promise in their scientific careers. The awards are administered by Caltech's Division of Physics, Mathematics and Astronomy. 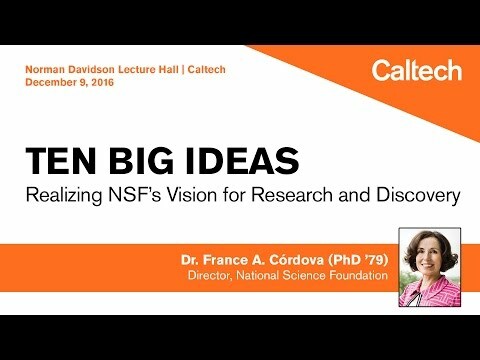 France Córdova, director of the NSF, met with Caltech students to discuss the NSF’s vision for research and discovery. The students were able to participate in a Q&A at the end of the session.